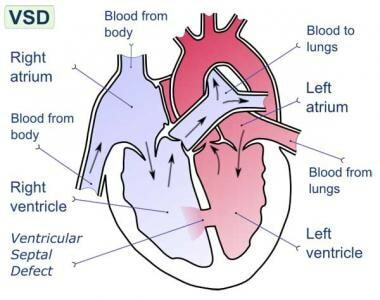 Ventricular septal defect (VSD) is defect in interventricular septum (wall dividing left and right ventricles of heart). To avoid the high morbidity and mortality associated with this disorder, patients should undergo emergency surgical treatment. [2, 3, 4, 5] In current practice, postinfarction VSR is recognized as a surgical emergency, and the presence of cardiogenic shock is an indication for intervention. Long-term survival can be achieved in patients who undergo prompt surgery. Concomitant coronary artery bypass grafting (CABG) may be required. The addition of CABG has helped improve long-term survival. Surgery is performed via a transinfarction approach, and all reconstruction is performed with prosthetic materials to avoid tension. Developments in myocardial protection and improved prosthetic materials have contributed greatly to successful management of VSR. Improved surgical techniques (eg, infarctectomy) and better perioperative mechanical and pharmacologic support have helped lower mortality. In addition, the development of surgical techniques to repair perforations in different areas of the septum has led to improved results. For information, news, and CME activities on heart failure, see the Heart Failure Resource Center. For patient education resources, see the Heart Center, as well as Ventricular Septal Defect and Heart Attack. The septal blood supply comes from branches of the left anterior descending coronary artery, the posterior descending branch of the right coronary artery, or the circumflex artery when it is dominant. Infarction associated with a VSR is usually transmural and extensive. About 60% of VSRs occur with infarction of the anterior wall, 40% with infarction of the posterior or inferior wall (see the image below). Posterior VSR may be accompanied by mitral valve insufficiency secondary to papillary muscle infarction or dysfunction. Heart sectioned transversely at level of middle left ventricle. Posterior ventricular septal defect is visible at site of recent acute myocardial infarction. At autopsy, patients with VSR usually show complete coronary artery occlusion with little or no collateral flow. The lack of collateral flow may be secondary to associated arterial disease, anatomic anomalies, or myocardial edema. Sometimes, multiple septal perforations occur. These may occur simultaneously or within several days of each other. Ventricular aneurysms are commonly associated with postinfarction VSR and contribute significantly to the hemodynamic compromise in these patients. The reported incidence of ventricular aneurysms ranges from 35% to 68%, whereas the incidence of ventricular aneurysms alone after MI without VSR is considerably lower (12.4%). The natural history of postinfarction VSR is greatly influenced by hypertension, anticoagulation therapy, advanced age, and, possibly, thrombolytic therapy. The natural course in patients with postinfarction VSR is well documented and short. Most patients die within the first week, and almost 90% die within the first year; some reports indicate that fewer than 7% of patients are alive after 1 year. This grim prognosis results from an acute volume overload exacted on both ventricles in a heart already compromised by a large MI and occasionally by extensive coronary artery disease (CAD) in sites other than that already infarcted. In addition, superimposed ischemic mitral valve regurgitation, a ventricular aneurysm, or a combination of these conditions may be present, further compromising heart function. The depressed left ventricular function commonly leads to impaired peripheral organ perfusion and death in most patients. A few sporadic reports indicate that some patients with medically treated postinfarction VSR live for several years. Although many medical advances have been made in the nonsurgical treatment of these patients, including intra-aortic balloon counterpulsation (IABCP), these methods have not eliminated the need for surgery. Rupture of the interventricular septum is an uncommon complication of MI. Although autopsy studies reveal an 11% incidence of myocardial free-wall rupture after MI, septal-wall perforation is much less common, occurring at a rate of approximately 1-2%. VSR occurs in a zone of necrotic myocardial tissue, usually within the first 10-14 days. Clinical studies report an average time of 2.6 days from MI to VSR. However, some data suggest that initial treatment of MI with thrombolytics may affect both the time between infarction and VSR and the eventual outcome. Early use of thrombolytic agents may lead to reopening of the occluded vessels, thereby reducing the incidence of VSR. The age range of patients who sustain a postinfarction VSR is wide, from 44 to 81 years. Men are affected more commonly than women are, though VSR is more common in women than would be predicted on the basis of the prevalence of CAD alone. If repair of a postinfarction VSR is performed 3 weeks or more after the infarction, mortality is approximately 20%; if it is performed before this time, mortality approaches 50%. The most obvious reason for this is that the greater the degree of myocardial damage and hemodynamic compromise, the more urgent the need for early intervention. With the use of an early operative approach, most studies show an overall mortality of less than 25%. Mortality tends to be lower for patients with anteriorly located VSRs and lowest for patients with apical VSRs. For anterior defects, mortality ranges from 10% to 15%; for posterior defects, mortality ranges from 30% to 35%. The most important risk factors for death in the early phase are poor hemodynamics and associated right ventricular dysfunction developing before the patient comes to the operating room. The amount and distribution of myocardial necrosis and scarring are responsible for both. Right ventricular dysfunction results from ischemic damage or frank infarction of the right ventricle and is present when stenosis occurs in the right coronary artery system. The higher mortality observed after repair of defects located inferiorly in the septum is probably related to the higher prevalence of important right coronary artery stenosis. The severity and distribution of CAD are also risk factors. Similarly, advanced age at operation, diabetes, and preinfarction hypertension are risk factors for death in the early phase. Koh AS, Loh YJ, Lim YP, Le Tan J. Ventricular septal rupture following acute myocardial infarction. Acta Cardiol. 2011 Apr. 66(2):225-30. [Medline]. David TE. Operative management of postinfarction ventricular septal defect. Semin Thorac Cardiovasc Surg. 1995 Oct. 7(4):208-13. [Medline]. Gaudiani VA, Miller DG, Stinson EB, et al. 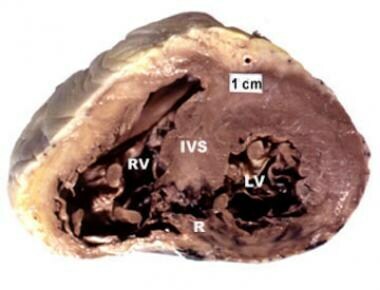 Postinfarction ventricular septal defect: an argument for early operation. Surgery. 1981 Jan. 89(1):48-55. [Medline]. Roberts JD, So DY, Lambert AS, Ruel M. Successful surgical repair of ventricular double rupture. Can J Cardiol. 2011 Nov. 27(6):868.e5-7. [Medline]. Kuthe SA, Mohite PN, Sarangi S, Mathews S, Thingnam SK, Reddy S. Repair of postinfarct ventricular septal defect and total myocardial revascularization in a case of dextrocardia with situs inversus. Gen Thorac Cardiovasc Surg. 2011 Jan. 59(1):42-4. [Medline]. Heitmiller R, Jacobs ML, Daggett WM. Surgical management of postinfarction ventricular septal rupture. Ann Thorac Surg. 1986 Jun. 41(6):683-91. [Medline]. Daggett WM, Buckley MJ, Akins CW, et al. Improved results of surgical management of postinfarction ventricular septal rupture. Ann Surg. 1982 Sep. 196(3):269-77. [Medline]. Muehrcke DD, Daggett WM. Current surgical approach to acute ventricular septal rupture. Adv Card Surg. 1995. 6:69-90. [Medline]. Serpytis P, Karvelyte N, Serpytis R, Kalinauskas G, Rucinskas K, Samalavicius R, et al. Post-infarction ventricular septal defect: risk factors and early outcomes. Hellenic J Cardiol. 2015 Jan-Feb. 56(1):66-71. [Medline]. Cummings RG, Califf R, Jones RN, et al. Correlates of survival in patients with postinfarction ventricular septal defect. Ann Thorac Surg. 1989 Jun. 47(6):824-30. [Medline]. Takahashi H, Arif R, Almashhoor A, Ruhparwar A, Karck M, Kallenbach K. Long-term results after surgical treatment of postinfarction ventricular septal rupture. Eur J Cardiothorac Surg. 2015 Apr. 47(4):720-4. [Medline]. Deja MA, Szostek J, Widenka K, et al. Post infarction ventricular septal defect - can we do better?. Eur J Cardiothorac Surg. 2000 Aug. 18(2):194-201. [Medline]. Okamoto Y, Yamamoto K, Asami F, Kimura M, Mizumoto M, Okubo Y, et al. Early and midterm outcomes of triple patch technique for postinfarction ventricular septal defects. J Thorac Cardiovasc Surg. 2016 Jun. 151 (6):1711-6. [Medline]. Arnaoutakis GJ, Zhao Y, George TJ, et al. Surgical repair of ventricular septal defect after myocardial infarction: outcomes from the Society of Thoracic Surgeons National Database. Ann Thorac Surg. 2012 Aug. 94(2):436-43; discussion 443-4. [Medline]. Stolt V, Cook S, Raber L, et al. Amplatzer Septal Occluder to treat iatrogenic cardiac perforations. Catheter Cardiovasc Interv. 2012 Feb 1. 79(2):263-70. [Medline]. Schlotter F, de Waha S, Eitel I, Desch S, Fuernau G, Thiele H. Interventional post-myocardial infarction ventricular septal defect closure: a systematic review of current evidence. EuroIntervention. 2016 May 17. 12 (1):94-102. [Medline]. [Full Text]. Ventricular septal defect on echocardiography. Acute anterior myocardial infarction on ECG.